Following Inbound 2018, HubSpot released a plethora of new functionality making this one of their biggest product announcements to date. 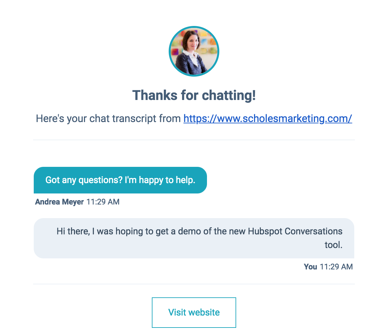 One major product update was the introduction of HubSpot Conversations. This new functionality introduces team collaboration, chat, and bots all in one place. Before we dive into 5 common use cases for HubSpot Conversations, let me show you around Conversations a bit. In your Conversations window you can read, reassign, and reply to all of your email and chat conversations in one spot. 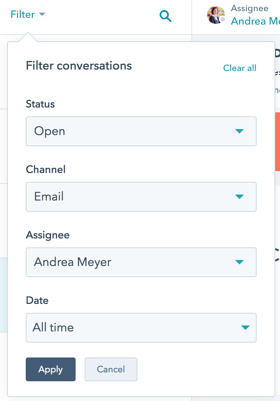 Filter conversations by assignee, status, date, etc. to keep your team organized and accountable. Associate records with an existing contact or create a contact from within the HubSpot window. 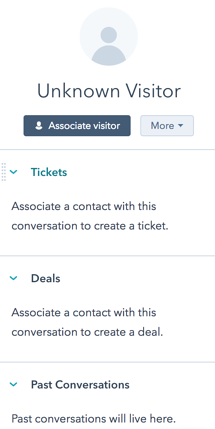 If you are using HubSpot Services, you can easily create tickets from the contacts window. 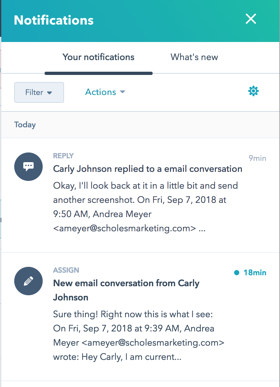 In your Conversations settings, you can determine which type of notification you prefer for your messages, such as browser notifications, email notifications, pop-ups etc. There’s even mobile notifications for mobile app users that allow you to respond to chat messages right from your phone. HubSpot Conversations also features a bot builder. You can learn more about bots and different types of bots in our blog post that covers it all. Log activity within the Conversations window. Keep track of the number of conversations your company handles as well as what content the conversations commonly include to better understand your prospects. With Chat, prospects and sales reps can receive a transcript from your chat conversations following the exchange. Routing of chat messages: Pre-qualify chat messages via bots. Start off with a series of qualifying questions by using something like, “in order to get you the best support we can, we would like to ask you a few questions.” For instance, ask for the country they are from or maybe what their company size is to then route the message to the appropriate representative. Manage support inbox: Support team leaders can easily see all support communication, open and closed messages, and who is working on them as well as assign tasks, add notes, or reassign any messages as needed. Cross-team collaboration – Streamline your sales/support hand off. 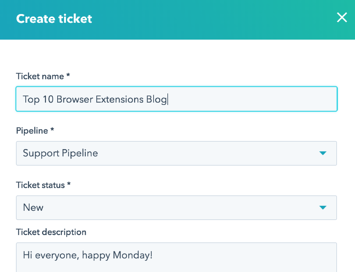 While many organizations nowadays have a ticketing system in place (such as Zendesk) as well as a CRM account, the hand off between sales and support is not always that easy, depending on how well the CRM and the support systems communicate. HubSpot Conversations conveniently offers everything in one place. Sales and support have access to the same records and cases can easily be handed off to support and back to sales once a ticket is closed. Help your customers help themselves – Use bots to address a string of frequently asked questions to help your customers find the answers they are looking for without having to engage with a representative of your company. The heart of HubSpot’s Conversations is, as the name reveals, a better way to communicate with your prospects and customers, no matter where they are located or which device they are using. Users today expect a timely reply by companies or a way to quickly find answers to their questions. Using HubSpot Conversations you can improve your response times, better qualify your leads upfront, and boost team productivity. If you would like to see a demo of HubSpot Conversations in action, feel free to reach out to us. 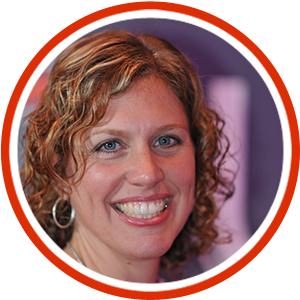 Prior to joining Scholes Marketing, Cathy worked as a marketing manager for Salesforce.com partner Harvest Solutions, which was acquired by LiquidHub. She was responsible for the overall inbound marketing strategy, website and digital marketing management, social media and sales and marketing analytics and reporting. She also managed customer communications, campaigns and events. Born and raised in Massachusetts, Cathy is an avid Red Sox and Patriots fan, enjoys hiking with friends, a good read, and spending time with her husband and daughter. 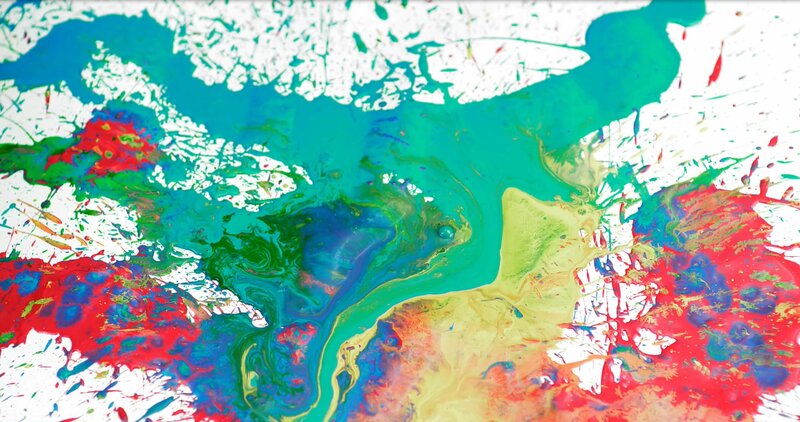 Let us paint your inbound marketing & sales success. You have the products, services and vision. We have the skills and strategy to build or enhance your ideal marketing and sales infrastructure.